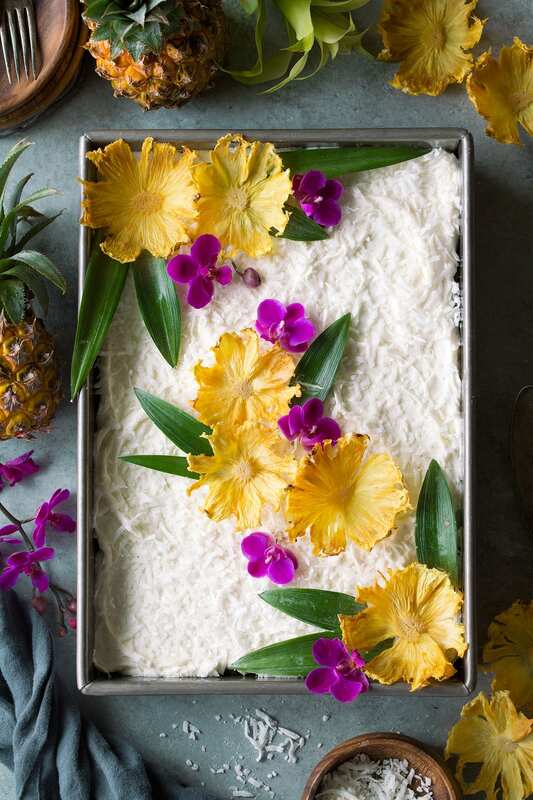 This Pineapple Cake from scratch is a tropical dream come true! 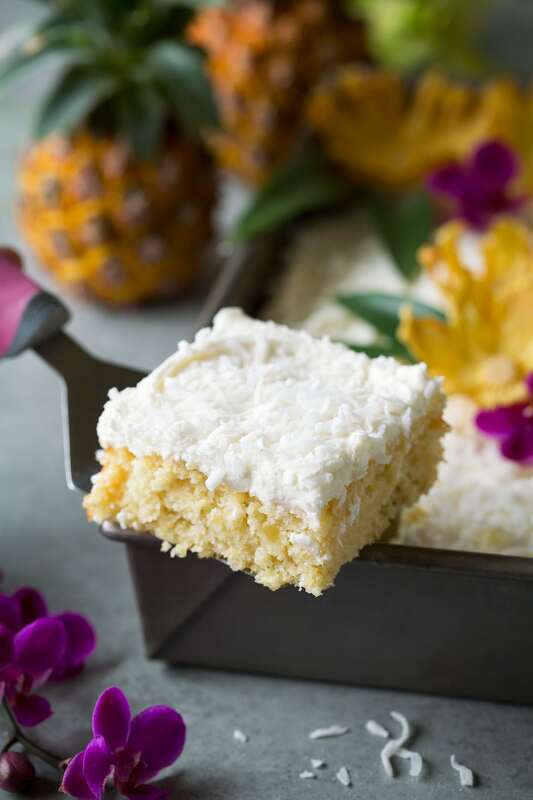 It’s an easy to make, seriously moist, deliciously dense, homemade pineapple cake with a fluffy vanilla buttercream frosting, and it’s finished with shredded coconut for a nice finishing touch. Yes I even dare say, it’s the best pineapple cake! 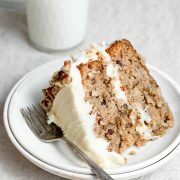 To make this cake you’ll do those standard cake making steps: Whisk dry ingredients. Whip butter and sugar then mix in eggs and vanilla. Then you’ll rotate mixing in dry ingredients with wet ingredients (which here is that concentrate and crushed pineapple mixture). Then bake it in the oven until cooked through, let it cool completely. Then bring on that ultra decadent, super fluffy, whipped vanilla buttercream! And if you aren’t a fan of coconut you can skip it but I liked the added flair. The the secret to my pineapple cake is pineapple juice concentrate. I made three pineapple cakes until I figured out the trick on the third attempt. The concentrate has at least 3 times the flavor as the juice from that in the can so it kind of seems like a no brainer. 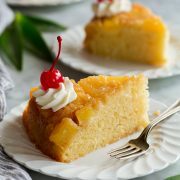 When I made it the first time and just used the can of pineapple and the juices along with it I could barely tell it was a pineapple cake. Switch that canned juice out with concentrate and boom – serious pineapple flavor! 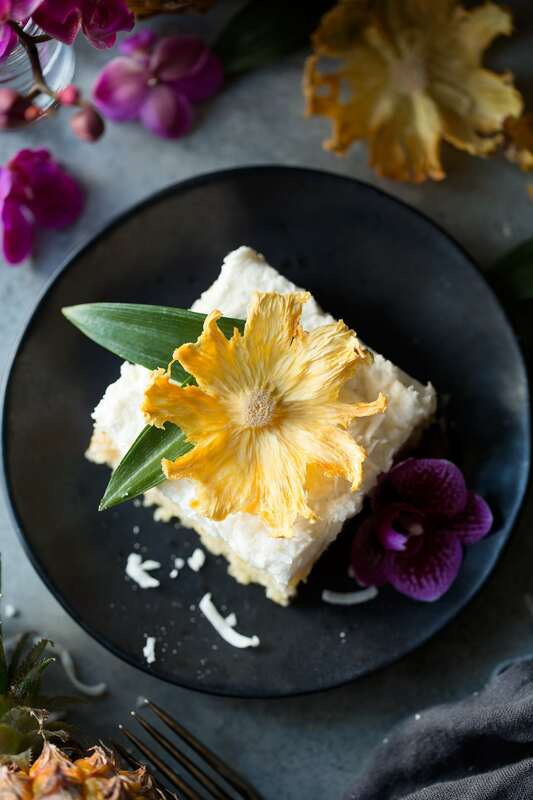 Then the other thing I opted to do after the first two cakes to was mince up the pineapple a little more in the food processor for a less noticeable texture. I don’t like very big bits in the cake. That step is totally optional though so if you’d rather just leave it as is. But do drain of alllllll that juice that’s with it. I did want to try fresh pineapple in the cake but I chose to stick with the canned for a softer texture and more consistent result. 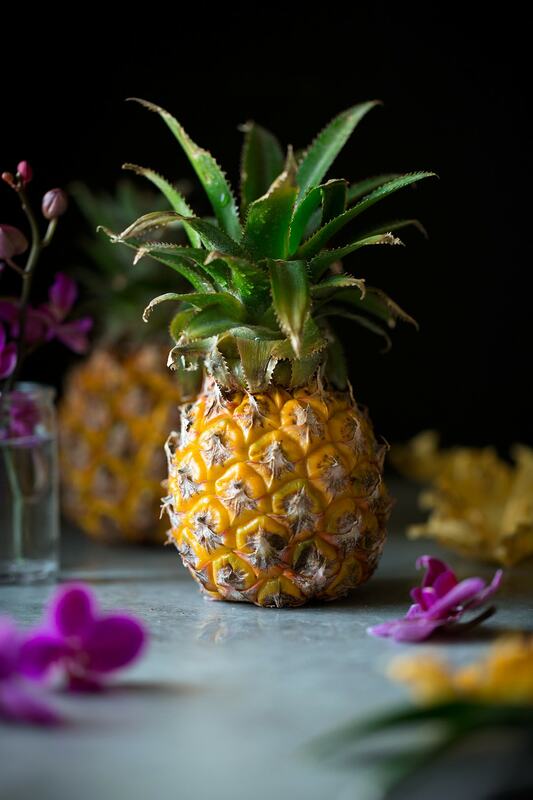 For the pineapple decoration – cut off that outer peel leaving the yellow portion behind, then use a pairing knife to remove the “eyes.” From there cut very very thin slices (as thin as possible). Preheat an oven to 225 and line two baking sheets with silicone mats (if you are doing the entire pineapple, otherwise just use one sheet for half). Then spread the sliced pineapple into a single layer and bake until dried, about 1 – 2 hours. Transfer to a muffin pan so they’ll curve upward as they cool. This would be the perfect dessert to serve this Easter Sunday. Or make it for your mom/dad/spouse/partner/grandmas/grandpas birthday – it is a cake everyone will love! I know because my whole family totally loved it, we ate it for 3 days in a row and couldn’t get enough. 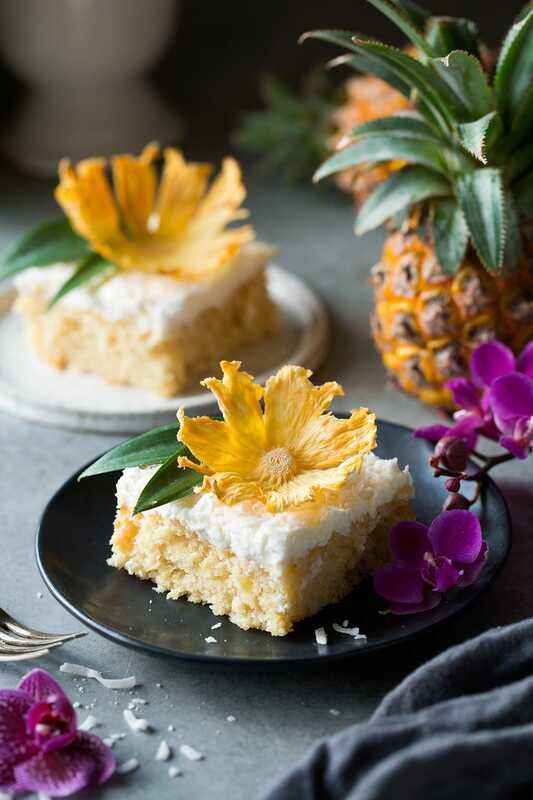 A super moist cake with an abundance of pineapple flavor that's covered with a fluffy whipped vanilla buttercream frosting and finished with a thin blanket of shredded coconut. This is a cake that's sure to please a crowd! Preheat oven to 350 degrees. Spray a 13 by 9-inch baking dish with non-stick cooking spray and set aside. In a medium mixing bowl whisk together flour, baking powder, baking soda and salt for 20 seconds, set aside. Set a fine mesh sieve over a bowl and pour pineapple into sieve to drain all of the juice well from canned pineapple, reserve the canned juice for another use (you should have a little over 3/4 cup drained). If you'd like the pineapple to have a finer texture pulse it in a food processor about 15 times or so to chop it up a bit, this is optional. In a medium bowl stir together crushed pineapple with pineapple juice concentrate, set aside. In the bowl of an electric stand mixer fitted with the paddle attachment whip together butter, sugar and lemon zest until very pale and fluffy. Add in 1/3 of the flour mixture and mix just until combined then mix in 1/2 of the pineapple mixture and mix just until combined. Add in another 1/3 of the flour mixture and mix just until combined then add in the remaining 1/2 of the pineapple mixture and mix just until combined. Add in last 1/3 of the flour mixture the mix just until combined, remove bowl and scrape down bowl with rubber spatula just to evenly incorporate. Bake in preheated oven until toothpick inserted into center comes out clean, about 30 - 35 minutes. Let cake cool completely on a wire rack. For the frosting, in a clean bowl of an electric stand mixer whip butter until fluffy. 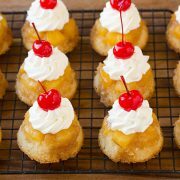 Add in heavy cream, vanilla, and powdered sugar and whip on high speed for approximately 5 minutes or so until it's very light and fluffy. 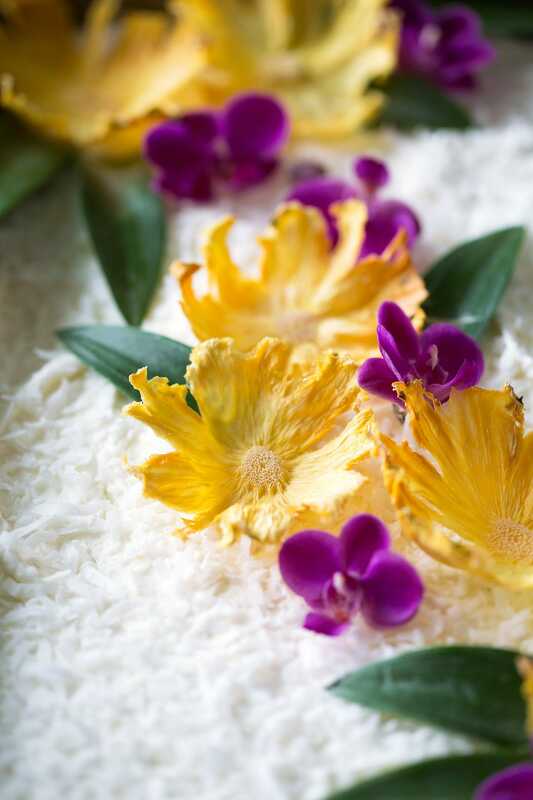 Spread frosting over cooled cake, top with coconut then cut into slices. *You can heat this in the microwave to thaw but you'll want to heat in 15 second increments stirring between each just until lukewarm, if it's too hot it will melt the butter.